← Well, it’s about time!!! FIGURE 1. First four layers of the Earth’s atmosphere draw onto a single piece of A3-sized paper. Large/long distances are difficult to experience, let alone imagine. This past week in our middle school science class we tried to develop a sense of scale as it relates to the thickness of the Earth’s atmosphere, a topic that we have been recently studying. Starting with an A3-sized piece of paper oriented in the portrait format (w: 29.5 cm, h: 42 cm), my students were asked to represent the first four layers of the atmosphere to scale on the paper. On this paper, the scale was 42 cm = 500 km. To put this differently, every 1 cm = 11.9 km or, in the reverse, every 1 km = 0.084 cm. An example of such a scale map can be seen at right in Figure 1. 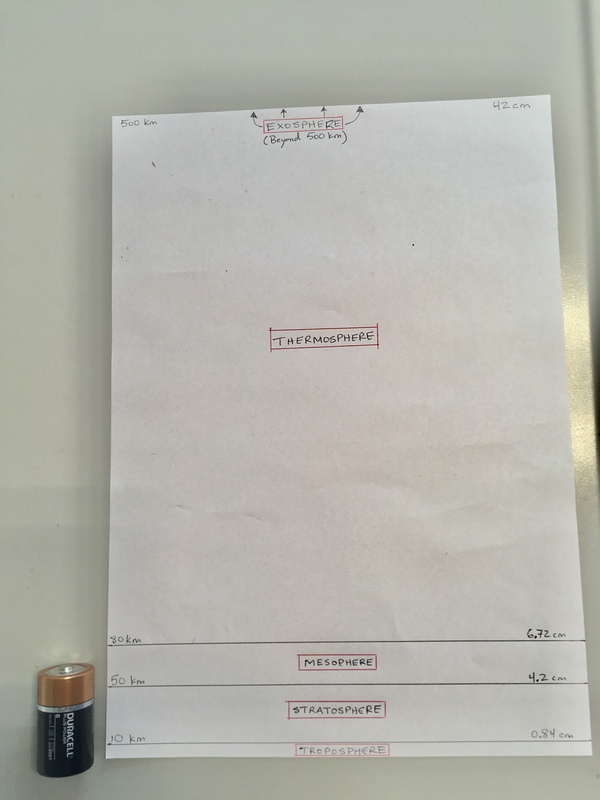 In Figure 1, a size D Duracell (battery) cell is included to help those unfamiliar with A3-sized European paper to better imagine the actual size of it. One reality that rather quickly stands out in this representation of the Earth’s atmosphere is just how ‘thin’ the first layer of the atmosphere (the troposphere) actually is when compared to the other layers. This scale map also shows that the next thickest layer is the mesophere, which is followed by the stratosphere, and then the thermosphere. The fifth and outermost layer of the atmosphere, the exosphere, is not represented on this map. But about the size of the Earth? If this scale were actually true, that is, if the thickness of the first four layers of the Earth’s atmosphere were in fact equal to the height of an A3-sized piece of paper, then how large would the radius of the Earth need to be in order to, as we often say in English, be true to scale? FIGURE 2. Our 4-layer atmosphere is visible on the edge of the nearest outdoor basketball court (A3 paper), but these two courts are still not enough to constitute a properly scaled radius of our Earth. Is the width of an outdoor basketball court (approx. 13 m) enough? 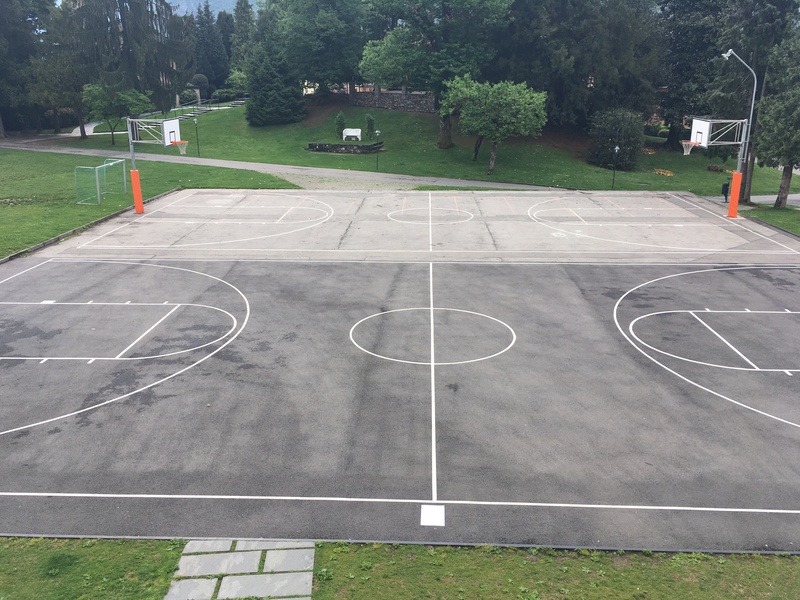 How about the the width of two outdoor basketball courts (approx. 26 m)? Would that be enough? Figure 2 shows our piece of A3 paper laying on the near edge of two rectangular basketball courts on the TASIS campus, just outside of our science building. The combined width of these courts–from the bottom to the top of the image–is approximately 26 meters, but in order to be true to scale, the radius of our model Earth would require us to have two additional outdoor basketball courts stacked beyond the existing courts. Only with FOUR courts could we have an Earth with the radius it needs to be true to our A3-sized paper scale. A four-court Earth would have a radius of approximately 53.5 meters–but remember, the radius is half of the diameter, so in actuality we would need EIGHT basketball courts if we wanted to estimate the ‘true’ size of the (entire) Earth in this scale model! If our model Earth here on the TASIS campus has a radius of 53.5 m, how many kilometers (km) would we have to travel from campus in order to arrive on the surface of the Moon? If our model Earth here on the TASIS campus has a radius of 53.5 m, how many kilometers (km) would we have to travel from campus in order to arrive on the surface of the Mars? If our model Earth here on the TASIS campus has a radius of 53.5 m, how many kilometers (km) would we have to travel from campus in order to arrive on the surface of the Sun? If our model Earth here on the TASIS campus has a radius of 53.5 m, how many kilometers (km) would we have to travel from campus in order to arrive on the surface of Alpha Centauri (the nearest star which is not our Sun)? This entry was posted in Earth Science, Grade 7, Middle School Science, Space Science and tagged atmosphere, Earth, maps, middle school, perspective, scale, science. Bookmark the permalink.